Google Allo vs. iMessage - Which app does it best? Update – February 28, 2019 – Google has decided to stop supporting Allo, and it will officially shut down sometime in March 2019. You can export your chat and video files before the shutdown happens. Messaging apps are like fine wine – they get better with age. Or, at least in the case of the two we’re looking at here – Google Allo and iMessage – that seems to be the case. Similes aside, with the launch of Google Allo late last year, and with the most recent updates to iMessage in iOS 10, it’s hard not to draw clear commonalities and stark differences between the two and wonder which one is actually the superior app. Yes, I know, this is Android Authority, and you don’t come here to read about Apple, but if Google has any hope of gaining market share in the world of interactive, rich messaging, they might have a thing or two to learn from Apple’s long-standing app. So, let’s take a quick look: Google Allo vs. iMessage. Let’s start by taking a look at the overall design, ease-of-use and fluidity of the apps. No matter what capabilities your app offers, I’m not inclined to use it unless it’s easy on the eyes, easy to figure out, and simply a joy to use. Fortunately, Google Allo and Apple’s iMessage both check off those boxes, but let’s take a look at some more of the specifics. If you’ve used any of Google’s other apps like Hangouts or Inbox, you won’t find any surprises in Allo. You’ve got the standard hamburger menu where you’ll find your application and profile settings, and a floating action button to start a new conversation. Inside of conversations, you’ll find a very Nougat-esque design language, with the pill-shaped text bar that is a bit less harsh than the hard corners you’ll find in something like Google’s SMS app, Messenger. For a little added flair, you can change up the theme of your conversations for more fun background designs and message bubble colors. It’s a small feature, but goes a long way towards making the app more fun to use. Given that iMessage has been around for so long at this point, there’s a good chance you’ll know what to expect when opening the app. Speaking of fluidity, there is no arguing that Apple goes above and beyond to create a uniform experience inside of their “stock” apps, and iMessage is no different. The brilliance of the iMessage application comes from its level of polish everywhere you look. Every animation, every menu, every button – you can tell that no detail was left unexplored to ensure that you get the best experience possible. The iMessage application embodies what users have come to expect of Apple, a reliable, well-thought, buttoned-up experience. Now let’s get to the fun stuff. At their core, both Google Allo and iMessage are simply messaging apps, but it’s their features, and lack thereof in some cases, that set them apart. Obviously, iMessage is an Apple exclusive, and Allo was designed with Android in mind, but let’s look beyond that. When Allo was announced early in 2016, its primary draw was, of course, Google Assistant. Assistant, the evolved state of Google Now, is intertwined within the app, able to be accessed from within conversations to pull relevant information such as weather, locations, movie showtimes, etc. At first, it kind of seems gimmicky to be texting with a virtual assistant, but after a while of using the app, it’s actually pretty convenient to have Google ready when you need it during any conversation. Google Assistant also exists as its own ‘contact’ in Allo, with which you can have standalone conversations. Here, you can basically query information like you would from the Google app, but your results will be returned in a more conversational manner. Assistant shines in this context by alerting you of reminders, sending you information like weather forecasts on a daily basis, and more. The conversational manner of Assistant also allows you to ask subsequent questions in context to get more information. For example, you can ask Google “What’s tomorrow’s forecast?” and you will receive a nice visual representation of what you asked for. Then, you can immediately follow up with “What about this weekend?” Google will recognize that your second question is related to the first, and will return the additional information. Furthermore, Allo’s suggested responses that appear automatically above the keyboard make getting more information from Assistant incredibly easy to do with little input. Let’s start with the basics – iMessage supports SMS. Sounds like a no-brainer, but given that Allo does not, it’s definitely worth noting. So yes, you can text anyone from iMessage, you just won’t be able to use some of its key features. Apple’s iMessage is a solid messaging app, no question about it. However, it doesn’t really have one ‘main draw’ like that of Google Allo. But, the fact is, it doesn’t need one. Unlike Android devices, iPhone’s comes with an excellent messaging application out of the box. One that’s packed full of features, and usually is enough to keep users from seeking an alternative. Many of iMessage’s flagship features focus on making conversations with your peers more intimate (in the innocent sense of the word) and personal. For instance, if you want to send a message to your wife saying, “I love you!”, you can add an animated heart balloon that will begin its animation when she views the message. Other examples of this include confetti that takes over the screen, party balloons that float up from the bottom of the screen, fireworks exploding in the background, a shooting star, and more. These message enhancements are taken a step further with actions such as Slam; powerful and large text bubbles, Whisper; smaller and gentle text bubbles, Invisible Ink; keeps text and photos hidden until tapped, and more. One of the coolest features of iMessage is the ability to replace words in your message with emojis. So if you type “Want to grab pizza tonight?”, the word ‘pizza’ will be highlighted as yellow text, and upon touching the word, will be replaced with a pizza emoji. On top of that, the App Store specific to iMessage has a ton of applications that enhance the experience of the app by giving you access to more stickers, the ability to make payments and more. It’s hard to name a clear winner in this category since the applications share the same basic messaging functionality, as well as some others, such as the ability to send photos and videos, audio clips, stickers (with additional packs available for download) and real-time location sharing. However, when it comes to sheer volume of the things you can do with the app, iMessage edges out Google Allo. It’s very clear how much time and attention Apple has put into its messaging application, and if taken full advantage of, iMessage is a really enjoyable communication application to use. Privacy isn’t something we think about all the time when it comes to texting back and forth with friends, but the truth is, any information that falls in the wrong hands can spell bad news. So, what do iMessage and Allo offer in the way of privacy? And, what are your backup options if you ever to need to restore your messages at a later time? Do you remember all that fuss about Google Allo indefinitely storing your messages to improve the app? Even Edward Snowden joined the conversation. Well yeah, that’s a thing. Messages you send with Google are protected from online predators by being scrambled from the time you send them to the time they reach Google’s servers, and again from the servers to the recipient, but Google does keep normal messages sent from Allo for their special use. Doing so allows Google’s messaging app to create those handy quick reply suggestions, as well as power Google Assistant. However, if you are concerned with your privacy, you can use Allo’s Incognito Chat to ensure your messages are encrypted end-to-end, so only you and the recipient can read the message. Incognito Chat also has a pretty cool self-destruct feature (called “expiration” in the app) that gives you the ability to have your messages disappear from your device, as well as the recipient’s, in a set amount of time. The amount of time can range anywhere from 5 seconds to 1 week. Backing up messages in Allo is something that definitely needs some work to say the least. Many users (including myself) have complained that when switching to a new device, you lose all of of your previous messages, even after linking the same Google account and phone number. Given that Google is storing your conversations for other reasons, you’d think they would at least let you sync your message between different devices, but unfortunately that’s not an option. iMessage doesn’t have any real privacy settings, but that’s because Apple swears by its built-in privacy. Conversations in iMessage are encrypted end-to-end, and Apple says they will never store or scan messages for their own use – preventing them, or anyone else, from ever invading your privacy. As you’ve likely heard about during recent events, Apple doesn’t create any “backdoors” with their products because that “undermines the protections” they’ve put in. The only two real privacy options you have with iMessage is the ability to choose how long your messages are stored; forever, a year or 30 days, and, how you would like your message previews to be displayed on the device. When it comes to backing up your messages, there’s not much to worry about. There is a ton to complain about when talking about iCloud, but you can count on your iMessage conversations being backed up and accessible in multiple ways. If you get a new iPhone, iPad or Mac, you’ll immediately find your previous conversations right where you left them. As part of their privacy promise, however, you can opt to not have your messages stored at all if having them later is something you aren’t concerned with. No app is without its flaws. Oh, where to start. Don’t get me wrong, I like Allo. I really like it, but it has a long way to go before it will be what most people want it to be. To start, there is no SMS support. This is likely the biggest complaint among all users, because without true SMS support, Allo can’t replace your other messaging applications. Sure, you can send SMS messages to people who aren’t Allo users, but there’s a catch. Instead of your message coming from you, the person you’re texting will get a message from a random 5-digit number. They’ll only know it’s you by seeing your name, followed by a colon, at the beginning of each message. On top of that, any Assistant-enabled functions you use in that conversation will come through as a vomit of links and special characters. I can promise this will come across as annoying to the recipient. Allo also has no desktop client. So for those of us who sit in front of a computer for the majority of the day, this is a huge disappointment. 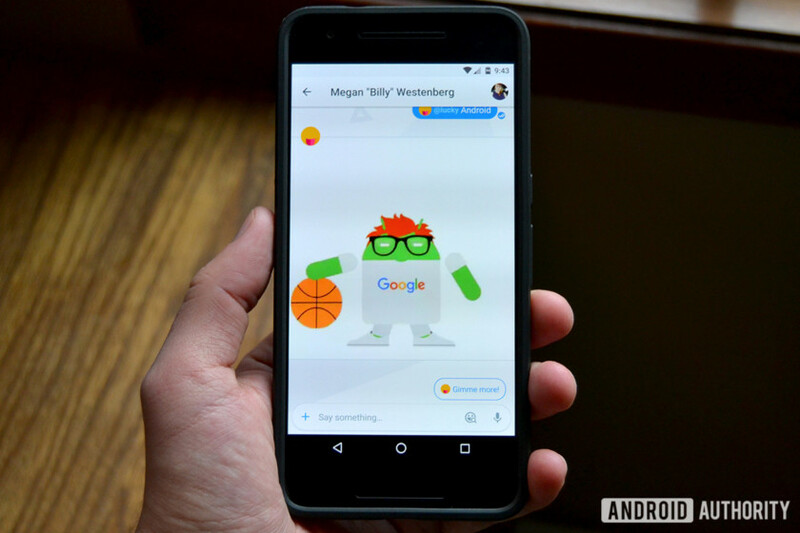 Sure, you could use Hangouts, but what’s the point in using two different messaging apps when you could just use one? With iMessage, your messages are synced across your other devices, including macOS. So that might satisfy your need for a desktop client. Hangouts can be used as a default SMS application, but you also have Google Messenger which is a dedicated SMS app with 50,000,000+ installs. So, Google already has a dedicated chat app, and a dedicated SMS app, so that begs the question – why introduce something brand new instead of improving on what you already have? For me, I was expecting a full-fledged text messaging app that could replace what I currently use. But, what I got was a glorified chat app with some really cool baked-in goodies (i.e. Google Assistant). I’m honestly having a hard time finding things to complain about for iMessage. For the most part, it’s a pretty polished app. But, like I said, no app is perfect. As an Android user and long-time fan, one of the reasons I don’t use an iPhone is because of the lack of customization. iMessage mimics that experience for me. There is no option to customize your conversations between different contacts with various colors, and you can’t change the background of your conversations, other than using screen effects mentioned earlier. My other complaint with iMessage is the slight learning curve when trying to grow accustomed to the many features available. For instance, to access the text enhancement features – Slam, Whisper, Invisible Ink, etc – you have to force touch the send button. But to access the stickers, GIFs, and other apps, you look in the iMessage App Store menu. To send heartbeats, kiss effects, etc. – that’s another menu. And finally, if you want to send a handwritten message, you have to flip the phone horizontally to reveal the sketchpad. Bottom line – there are just too many features in too many places. Until you’ve had considerable amount of time to play around, you might find yourself hunting for a certain feature. Lastly, I mentioned how iMessage syncs across all of your Apple devices, but what if you don’t have a Mac? In this case, you’ll have no means of using iMessage from your computer. This is especially frustrating considering that almost all other iCloud applications are available to access and use at iCloud.com, including Notes, Reminders, Photos, Calendar, and more. So why, Apple? Why haven’t you made iMessage accessible with an online interface? So, how do we wrap this all up? Well, I’m not going to call a clear winner here because I like both apps for different reasons. Sure, if we’re talking sheer volume of features, and level of polish, iMessage takes the cake, but the truth is, I have just as much fun using Allo as I do iMessage. And for me, that’s really what it’s about. For Google Allo, I think the problem lies in how it was launched, how it was positioned at launch, and what users thought they were going to get, but didn’t. For Allo to pick up any steam, and gain more market share among the other messaging apps, Google needs to make this clear to consumers. Google Assistant is an excellent selling feature, but without being able to text other people not using the app, why would users adopt this vs. Google Messenger? And, with no desktop interface, why would anyone adopt Allo instead of Hangouts? As for iMessage, it clearly has its place in Apple’s ecosystem. You have it on your phone, you have it on your iPad, you have it on your Mac. Your messages sync across devices, are backed up for when you get a new device, and there are ton of cool features to make sure you’re always having fun. But, iMessage is missing that one BIG THING to really sell it. Maybe if Apple could improve Siri (on a couple of different levels) and integrate it into iMessage, similar to that of Google Assistant in Allo, there would be more of draw to the application. Fortunately for Apple, they have a leg up with the app being installed on every device. No need for them to worry about consumers having to beg their friends to jump on the bandwagon. They’re already there. What are your thoughts on this subject? Will Google Allo ever be the iMessage of the Android world? Are the features in Google Allo enough to keep you interested and to make you try to convince your friends to join you? Let us know in the comments below!